leaving from San José and 2 hours before leaving Bocas del Toro. As an essential requirement for boarding and compliance with the provisions of Aviation Civil, the passenger will be asked for an Identification. In the case of Costa Ricans, passports do not are necessary to travel with in Costa Rica, but the identity card if necessary safety reasons. In the case of foreigners it is a requirement that they carry their passport up to date or residence card, these documents will be required at the time of the "check-in"
Passengers who do not comply with this requirement will not be able to board the aircraft and there will be no refund, credit or possibility of taking another flight. If for any reason the passenger (s) require any assistance, it is important that they be inform reservation staff in order to write it down in the reservation. In the case of Folding wheelchairs will be transported without any additional charge. 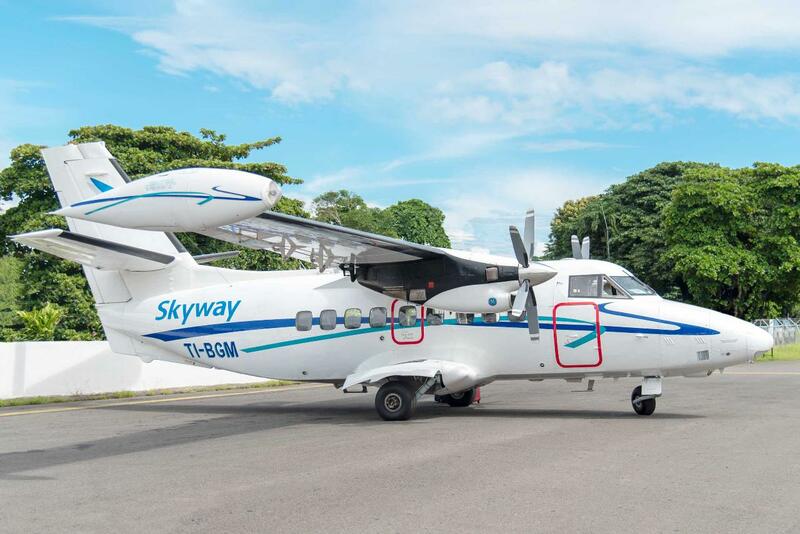 SKYWAY does not guarantee any preassignment of seats in the aircraft, therefore, it is considered as free seats. Departure, $ 15.0 at the entrance of Bocas del Toro and $ 3.0 airport use per person. Every passenger will be entitled to a piece of checked luggage. The amount of pounds will go according to the purchased rate. 40 pounds of checked luggage. Passengers may carry a piece of luggage inside the cabin of the aircraft provided and when it does not exceed 10 pounds and has a size that allows it to be accommodated under the seat in front and whose dimensions do not exceed 25 inches. Passengers must carry the medications always in the cabin baggage (Carry On).Excess baggage will be charged at the airport. Will be charged $ 1 .00 per pound additional. All Baggage is subject to space and must be canceled only by half of credit card. Passengers traveling under the same reservation may share the luggage reason why they may carry double the weight, as long as the maximum weight does not exceed the amount of pounds allowed in the purchased rate. Golf equipment, skis, surf boards, baby cars. flight, however please check with our reservation staff before your trip to accommodate the transportation needs of this equipment.